Run N Gun is a challenging shooting game in which you will not only have to worry about the incoming rockets but also trying to keep up with the game and not fall behind. There are lots of obstacles you need to jump over and also avoid falling into the gaps. You have a boost as a second jump but this can be as much of a life savior as a death sentence as it can make you fly right in the heat of the battle. 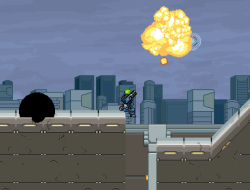 Use your guns to shoot down all the enemies and the rockets they fire at you. Use the mouse to aim and fire, WASD to move and jump. Run N Gun 10.00 between 0 and 10 based on 1 votes.